I wanted to create a simple scarf as a gift for my mom with this beautiful chunky yarn that my brother picked out! I was surprised how difficult it was to find a simple scarf pattern for a knitted look… I discovered a simple way to get a flat scarf with a ‘knit look’ on both sides!!!! All rows: [k1, p1] slip last stitch. Pattern Notes: Adjust stitch count in multiples of 2. 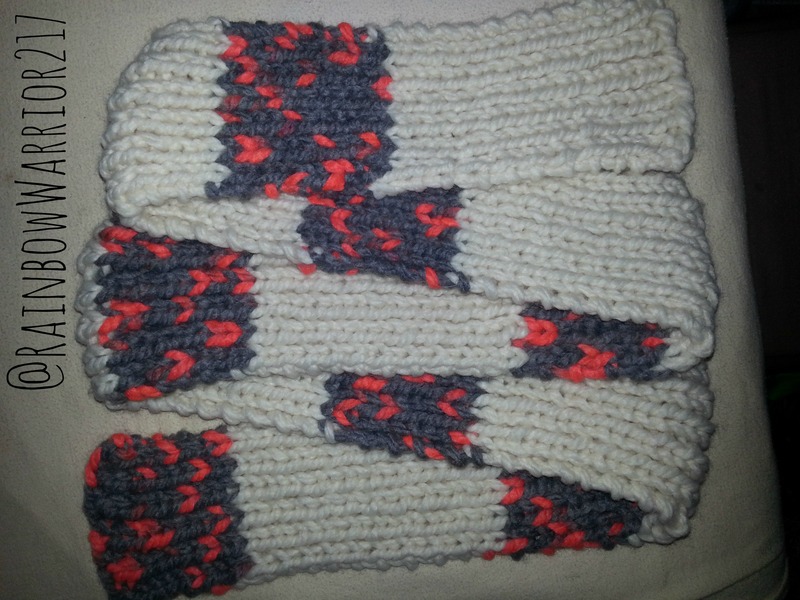 I used 20 rows of Color A and 10 rows of Color B for the color pattern in my scarf. Watch the video tutorial to see this simple pattern in action! Really simple & great to show off a beautiful yarn or color design! Posted in Knitting Patterns, Video TutorialsTagged knit pattern, knit scarf, knit tutorial, knitting, scarf patternBookmark the permalink.